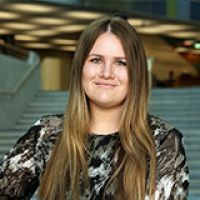 The opportunities and experiences AUT offered were the highlight of her university journey, says business alumna Gemma Keay. “I never thought I could achieve what I have done throughout my time at university. Time and time again I’ve had the opportunity to practise the theory I’ve learnt at AUT and put it into action. Deciding to study a business degree was easy, Gemma says. “I wanted to pursue a degree that would challenge and expand my perspective on the world. How the business world operates has always interested me, in particular the similarities and differences between different countries’ business practices and how culture ingrates its influences on such practices. Taking up the opportunity to do postgraduate study was also an easy decision for Gemma. After graduating at the end of last year, Gemma is currently working at world-renowned finance firm Zolfo Cooper in New York. She got this sought-after internship through the AUT Internz International Scholarship Programme. She has had many highlights throughout her internship, Gemma says. “Each week is different, which was a great way to vastly widen my knowledge and experience in a short timeframe. I also love that Zolfo Cooper has a strong company culture, which was visible the moment I set foot in the office. This made the transition into the company easy and allowed me to get involved in a variety of projects from the get go.